Hot summer days and friendly picnics have made way for busy schedules and changing seasonal colors. Start the season off right and make the transition a smooth one by entering the Step into Fall Dirt Lift Sweepstakes for a chance to WIN $1,000, plus a year’s supply of Purex with Dirt Lift Action Detergent. It’s okay to admit you need a break from piling bills and daily school lunches. Spend some time, and hopefully some money, on yourself this Fall and enter now. 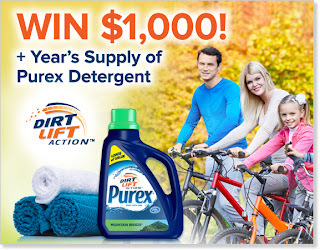 Purex with Dirt Lift Action Detergent gets your clothes so bright, white and clean that people will start to notice. Summer has officially ended and the new school year has begun. 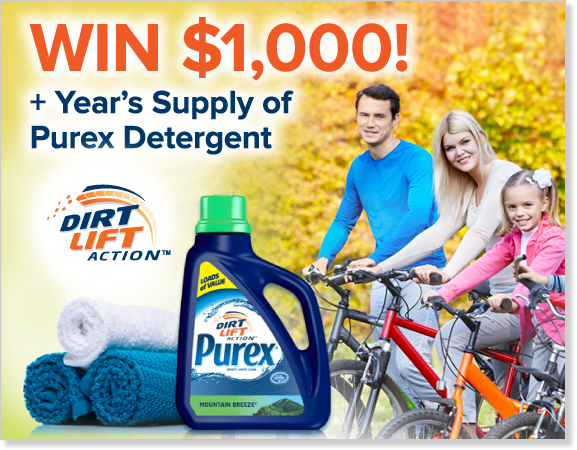 Let Purex help you step into Fall with a bang and enter to WIN the $1,000 grand prize and a year supply of Purex detergent today. To have a chance to win this wonderful prize just Enter Here and good luck!